Letter writing and even sending cards seems to for the most part be a thing of the past. Even sadder is that a lot of people don't seem to even say thank you. A far cry from when I grew up. Toys could not be played with or clothes worn until a thank you note had been written. Of course if it was a truly hideous piece of clothing I would drag my feet about writing the thank you note. This year a neighbor surprised me with a gift card to a restaurant, I had a lovely dinner Christmas Eve with a friend breaking my rule of thank you notes or cards first. Also a friend's mother gave me reversible construction paper and I broke my rule there also. However, this is the card I came up with for the neighbor and will be making one for the friend's mother also. This was a free file from My Scrap Chick. If you are not on their mailing list you may want to sign up for their weekly free file. Their files are in different formats including a pdf file so you don't need a cutting machine if you don't have one. I decided I wanted to see how the construction paper cut out. The orange pattern is that paper it cut like a dream. I cut the cup out of foam. I used scrap card stock for the letters. I did have to switch to the SVG format as it would not cut out "thanks" right. After three tries I went in and looked at the points and figured I just didn't want to be editing points for hours. After the change to format set thanks to cut and it did it perfectly. Latte on the circle was suppose to be cut out but also could not get that to cut out so sketched it instead. Will see what happens with that for the next card as I changed format afterwards. You may have seen this title and wondered what in the world does toilet paper and rubber stamps have in common. Well I'm here to tell you today that they can be a inexpensive option to high priced embellishments. Besides that this is something that even the kids can do. If you are like me you have a bunch of rubber stamps languishing in a drawer. Of course unlike me you don't feel guilty about them taking up the space not earning their keep every time you open the drawer up. Final layer with Forever Green Perfect Pearls brushed on while still wet. I played around with a couple of stamps and finally decided to use my leaf block stamp. Block stamps may seem a little expensive at first glance but remember you are getting four stamps in one. Also they are great for making your own background paper and other stamping projects. I was lucky the day I bought mine they were having a sale on them. A good thing too because I liked both of the ones that were left in stock and was having a difficult time deciding which to buy. The cheapest single ply toilet paper you can find works great for this project. However don't go wasting your gas just to buy a roll of single ply. If you have double ply it separates easily,.If you are using double ply you need four sheets and single ply eight sheets. You are going to make eight layers. So lets get started. Place your stamp face side up on your work surface. Cover with single ply toilet paper. Dip a brush in water and use it to dampen the paper. I used a pouncing motion with the brush to get the paper in the cracks and crevices. (A stencil brush works great for this but if you don't have one a cheap paintbrush will work.) Don't worry if the paper should tear. I just pressed it down with my fingers after dampening them. I did as I added layers press the new one down with my hand and then used my brush. Dampen as needed. I used the q tip seen in the picture to go around the edges of the branches. It is optional. As I was layering my paper I got to thinking that I did not really want the finished product to be white. I added Stream and Butterscotch alcohol inks to my water to make a green. If you are not worrying about the possibility of the colors fading over time you could use food colors to color your water. Of course using clear water is always an option. Allow to dry overnight on your stamp. Make sure it is completely dry before taking it off your mold. Trust me on this one. Patience is a virtue in this case and you don't want to ruin your work even if it didn't take a lot of time. After you take it off your mold trim it. If you don't like the white or want to highlight areas you can use glitter pens. You might want to decorate it with jewels or brads depending on the stamp you used. You can carefully wipe a chalk ink pad over it for a soft look or even wipe your chalks. Just be careful to not get your molded image too wet or you will lose the impression. Hmmm....wonder how I know that. LOL! Now that my piece is dry I'm leaning towards trimming it and using the other side. The impression is crisper and I like the way the coloration turned out Either side you decide to use you will have a unique embellishment for your project. Also those stamps are doing double duty. Thank you for stopping by and Happy Holidays no matter what holiday you celebrate. Who Said Cards Had To Be Square or Rectangle? This is a card I just finished. If the snowflake on the front looks familiar it is because this is the one that was on the box that I shared here. I just erased the box lines and drew a circle to put it in. I heat embossed it after my Cameo cut it out with Winter Wonderland embossing powder. Then the card base I heat embossed with Star Dust embossing powder. The snowflake was cut out of a scrap of white card stock and the card base was cut out of a scrap of card stock I had used for making the lid of a box. I decided to make a round card. I wanted something that was not a typical Christmas card. Simple but I think really elegant looking.I wish I could have gotten a better picture to really showcase the beauty of it. With Silhouette machines and their software it is so easy to use up scraps of paper in projects, Also so easy to modify files or create your own. Now if that is not being frugal I don't know what is. Thanks for taking the time during this busy time of the year to visit my site. This is going to be a gift for a friend's mother. I wanted to make her something special because she is a special lady. This is just cut out from card stock using my Cameo. The cutting file was designed by Doodlingdebbie. She is the administrator of the Silhouette Plus Forum and has the blog Paper Pulse. You will find both the forum and her blog listed on the right hand side. For some reason two of the ends of the outer flourishes kept being cut off so I went and cut them all off. I traced around the image in order to get the backing piece. For some reason it did not end up being the exact size of the silhouette but I like the way it turned out. I did not look close at the file while gluing so the girl and boy are higher in the air and I had to do some changes of the layout. Still I think I like how it turned out. I glued down the shapes with Elmers glue.It was a little tricky gluing the frame. Then brushed Elmers over everything. After it was totally dry I adhered rhinestones to the stars using my heat tool . I love using it and I know that the rocks or rhinestones will not be falling off of projects. This is my first coat of the Dimensional Magic. As you can see it is milky looking. You can see in the picture there are a few places where the Dimensional Magic is not even. The piece was not completely flat so the product ran a little bit. (Note to self next time place wooden blocks if need be under to make it level as well as to keep it from sticking to surface. Luckily I was able to carefully with a knife get it unstuck and on a block of wood to finish drying.) I did after taking the picture get rid of the small bubbles that I had not noticed. After it dried for 24 hours I added a second coat. But this time a lighter coat.That is what I did on the key chain and it really made for a nice finish as it filled in places where I did not get an even coat. This is what the finished brooch looks like. Sorry the picture does not do it justice. It is really awesome looking even though in one place the black from the card stock bled a little. I must not have gotten it covered with glue in that place. I just need to glue the pin back on and it will be done. So here is a gift that cost me less than a dollar to make. Here again the drying time took longer than the actual making of it. I can't wait to try some other ideas using different papers and patterns. Although I covered over the gems you could have the Dimensional Magic just go around them. You could add beads,charms and other embellishments to your project. Use your imagination and be creative. If you are using some sort of a card stock frame you could heat emboss the frame or use perhaps a metallic marker. Have you used Dimensional Magic? If so what did you use it for? I had today one of my why didn't I think of this sooner. I didn't have glitter or shimmer paper in the color I wanted for a project. I picked up my piece of dark blue card stock which was the color I wanted to use for a project and thought to myself I wonder what would happen if I used VersaMark watermark ink and some transparent heat embossing powder. I had bought Star Dust heat embossing powder and was not happy with it when I tried it out on different projects. I was making another snowflake box and decided to try it on the top portion. Wow! I love how it turned out when I added the heat. The picture doesn't do it justice. It looks like a fiery Australian opal. A little bit of the embossing powder goes a long way and this is a great alternative to glitter paper. Also since you can do this after you cut out your shape you won't ruin your blade or cutting machine. Also you don't have to wait for glue to dry or worry about it flaking off. I don't have good light for taking a picture of the box top but this card stock peeking through the snowflake is absolutely gorgeous. This is something you are going to want to try. It is so easy. Just stamp your pad onto your paper or card stock. Sprinkle your embossing powder and use a heat embossing tool. I found this cute box file at the Silhouette store for $.50 during their $.50 sale for every file. Well it is no longer $.50 but you can still get it for under $1. Right now it is on sale for $.75. I did go ahead and modify the file. I duplicated the top and then in my software released the compound path. Then I went and manually turned off all the cut lines for the snowflake. This way I was able to cut out a solid top which was then glued to the snowflake top. This made the top sturdier and I like the effect of the shimmer card stock I used shining through. This box is the perfect size for the Christmas tree pin I made as well as the brooch that I just finished. I am thinking of stamping and heat embossing snowflakes on the base for the next one I make. As well as sprinkling glitter on the snowflake. Wouldn't this be cute to fill with some Christmas candy or cookies as a gift. Come back Thursday to view the awesome brooch I made with Dimensional Magic and card stock. I am pleased with how nice it turned out. Thank you for stopping by. I love freebies and I love shabby chic as well as vintage. Millie Dee had this cute digital kit as a freebie I believe it was part of Scrapable Twelve Days Of Christmas. I think it was only available for one day as I've been unable to find where I found out about it.Thank you Millie. You can easily do something similar with any kit you may have or find online. You can also mix and match elements from different kits. If you have not used digital kits check them out as there are a lot of really nice free ones out there in cyberspace. It was easy to print the papers out on my printer. I did with the lightest paper randomly stamp with VersaMark ink and heat embossed snowflakes. on it. I have to have a touch of glitter. With my Studio software I re-sized the frame and snowman. Turned them into a Print and Cut file. Filling a page full of both of them. Doing this along with the printing and cutting took maybe five minutes. Then it is just assembling the card. I used my tape runner for that so no need to wait for glue to dry and everything is stuck down tight. The snowman could have been placed on the card with dimensional dots and could still be mailed without an extra charge. I found the pre-scored card bases on sale in a pack of 350 of them for under $10. LOL! I though it was just assorted card stock. O.K. I know you are dying to see the card. TA DA! If you don't have a digital cutter like the Silhouette Original,SD,or the new Cameo you may want to write Santa a letter asking for one. This is one of the best investments I have ever made. It makes so many crafting projects quick and easy. What I like about the Silhouette is there is no cartridges to buy and a lot of the files are free or you can even convert your own images into cutting files. As the holidays are drawing closer I hope that you are finding time to create and finding joy in creating. Do come back Thursday or Friday as I should have an awesome brooch to share that is made with card stock and Dimensional Magic. LOL! That is if I can be patient while the Dimensional Magic dries. Are you getting excited? Christmas is on its' way. I feel this year like I am one of Santa Elves. Just wish I looked better in leggings and a pointy hat. I found at a dollar store a roll of green fun foam. What I am going to do with all of it I don't know but I thought when I saw it that it would be cute to make a Christmas tree pin out of it. With the software for my Silhouette I cut the Christmas tree out using the maximum settings and double cutting. Then brushed glue and sprinkled glitter on the two tree pieces. For the trunk I used a permanent marker to color it. I forgot to color it before I sprinkled my crystal glitter on it but like how it turned out. I was surprised that the little star cut out so nicely. I colored the rhinestones with permanent marker while they were still attached to their card. Make sure the ink is dry on your rhinestones before attaching to your tree. I also went and cut out of the card stock just the outline of the tree to give it more stability and the pin back is glued to that. It actually takes longer for the glue to dry than to make the pin. I think for the next one I'll see what happens when I run my tree through my "Creative Station" to apply the glue. These pins are so easy to make that it would be a fun project to do with kids. Have fun and remember to have fun with fun foam. There are so many cute pins or even toppers for hair clips you can make with fun foam. The possibilities are unlimited. 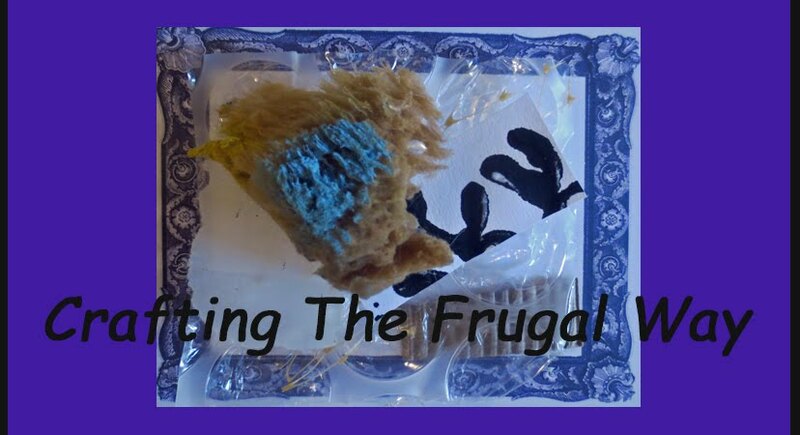 Thank you for stopping by and do come back for some more "Crafting The Frugal Way". Took me a bit to figure out how to do this without the ink smearing. Everything I read said to use Mod Podge before using the Dimensional Magic. Well I looked at my bottle of Decoupage medium and it said it takes four weeks to cure. Ummmm.....I don't have four weeks. So after much playing I discovered that the best thing to do was to brush undiluted Elmer's all purpose glue on the card stock that I had printed my photo on. While playing I decided to see if I could rub Tim Holtz distress vintage ink over the photo after the glue had dried. The upper left hand photo is what the photo of JR looked like before I applied the glue and vintage ink. Underneath is the photo attached to shimmer card stock cut out with a Spellbinder circle die. I ran it through my Creative Station for the adhesive but a tape runner will work. I discovered that glue will cause it to bleed when gluing to the card stock.. Then it is coated with the Dimensional Magic. The photo doesn't really do the Dimensional Magic justice as it looks like the photo is encased in glass. I could just coat the back of the shimmer card stock and call it good but Buddy would feel unloved. The bottom right hand image is before with the glue dried on it. The picture below is after with Buddy now on the other side with ring for attaching keys. You could also use a small jump ring and make this as a necklace. It is normal for the Dimensional Magic to be milky but it should dry clear. With a pin pop any bubbles or it will crack. I used a little on paper first to get rid of bubbles before applying to my project and only had a couple of tiny bubbles to pop. Also your project will crack if your glue is not completely dry before applying the Dimensional Magic. Do be patient and let the Dimensional Magic dry. Preferably for at least twenty four hours before coating the other side if using card stock as your base.. I did use a heat lamp to help it dry faster.Make sure it is in a draft free area while drying. It costs me very little to make this. $4 for a 2 oz bottle of Dimensional Magic by Plaid and you just use a little. As well as what it cost for my card stock which was scraps. This would be a great way to use up those scraps of paper you have. You could adhere your papers to wood shapes. Just drill a hole. You can also buy jewelry and hair clip findings for this but we are talking cheap here. A craft place wanted as much as $12 for the metal tray pendant. The friend who I was going to make the necklace for so he can give to his mom said that is too much. So I decided to see if card stock would work as a base. Well I'm off to making a small box to put this in. Hope things are going well with your making of gifts and holiday preparations. Thanks for stopping by and see you again soon. I have looked high and low and the playing cards I was going to use making Christmas cards have disappeared. So it is off with another plan. I bought some gesso to use on fabric so I could stamp it with regular inks. Well I never used it. Last night I decided to play. The card here I brushed the gesso on my card stock and used my swirling snow stamp in it. While it did give an interesting look and does look like snow especially after I sprinkled glitter in it while it was still wet. It is not what I was after. I thought it was interesting that in places the stamp picked up the gesso from the card stock leaving it to look more like little snow drifts. I decided to see what happened if I mixed green soap dye in with gesso. My first experiment stamping on card stock was awful. It all ran together.This time I brushed the mixture with a foam brush onto my stamp. I found it worked best if I then stamped once on a paper towel and then stamped on my paper. For this one I used a paper that is designed to be used with ink. I like how this turned out even though it did curl a little bit. I definitely will keep this in mind for making my own background. I want to try with water color paper and other papers. The gesso is suppose to be a resist so later I'll do more playing. Have you done any experimenting lately? What artist supplies have you used? Don't know what I'll be experimenting with next so do come back and see. Hope you are having a fun week crafting and that your holiday plans are all coming together smoothly. When you are holiday crafting for gifts or ornaments don't forget Shrink Plastic. I made these cute ornaments/tags using the Frosted Ruff Shrinky Dink. $6 for ten sheet means it is less than $! for an ornament or tag and the scraps can be used for other projects. I used an ink jet printer and the ink did not smear on the shrink plastic using the Ruff. Roughing up the white it smeared even after baking it. I have not tried the Inkjet Shrink Plastic as it is more expensive. I took the Looney Tunes cutting files I had bought from the Silhouette Store and turned off the cut lines.Drew an ornament shape in the Silhouette software and added names. Be sure to mirror names and images. I cut these out with my Cameo doing a double cut. I have cut Shrink Plastic with my Silhouette SD but had to do it about four times. Do so at your own risk as I read about burning out the motor. If you don't have a cutter you can do your image in a graphic program, print and cut by hand. PaintNet is a free graphic program with lots of features if you do not have one. I need to add the cord but have not decided what I want to use. I think these are adorable and will go perfect with the looney tunes tree lights that they have. Shrinky Dink's website has free patterns and all kinds of ideas. So if you need quick easy gifts head on over for some neat ideas. Hope your holiday plans are going smoothly and that you are having fun. 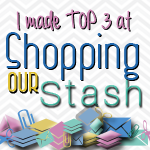 I have one more gift that needs to get done as it needs to be mailed and then hopefully I'll get busy crafting cards. I have not forgotten about the Christmas cards using playing cards. LOL! Don't Throw Those Scraps Out! Christmas is fast approaching and I don't know about you but I'm busy wrapping presents and trying to get things ready to mail. Today while wrapping gifts for my granddaughters I used the last of this Disney Christmas wrapping paper. I was looking at the scraps and thinking what can I do with this. I ended up cutting with my die cut machine some of the images and then cutting scrap card stock. I glued the wrapping paper cutout to the card stock. Viola! an instant tag which matched the paper. 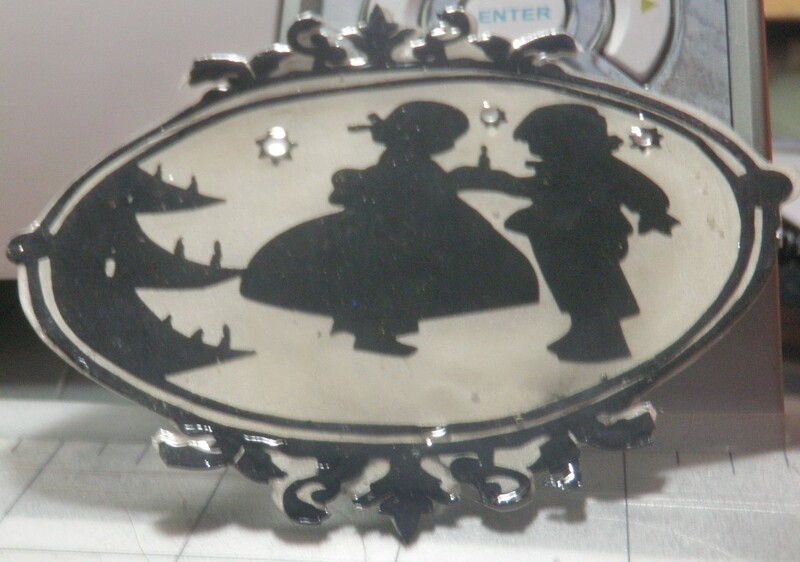 Could also be used as an embellishment on a card or scrapbook page. What do you use scrap wrapping paper for or do you just throw it out? Also do you use other pieces of scraps like the selvage on fabric for something? Are you a scrap hoarder? LOL! Time to confess. Hope whatever you are doing to get ready for the holidays you are having fun. I'm off to finish packing a box for mailing.